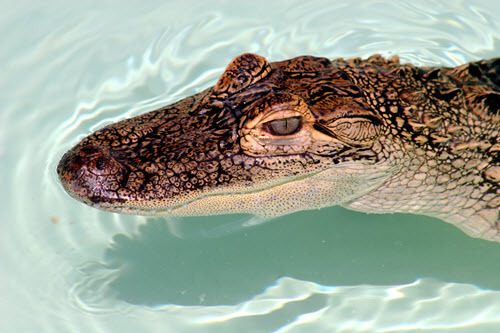 Pet Alligator Covered By My Home Insurance? If you own a pet alligator or some other exotic pet (like poisonous snakes) and they injured another individual and you were sued would your home insurance pay? The answer is that it depends on the exclusions in the liability section of the homeowners insurance policy you purchased, and it depends on whether or not you own the alligator (or poisonous snake) before you bought the insurance policy. Example: Eddie decides it would be pretty cool to own an alligator so he buys one online and named him Alfred, raises it in his bathtub, and as Alfred grows larger he builds an area in the basement for the alligator to live. Eddie has a party at his home on a Saturday evening and decides to show off Alfred to his guests. One of Eddie’s guests named Leo decides it would be a good idea to try to pin Alfred the alligator. Leo is unsuccessful and Alfred doesn’t like to be manhandled plus he’s feeling a little hungry and bites Leo’s arm off. 911 is promptly called along with the police who euthanize Alfred, and a veterinarian attempts to recover Leo’s arm but it is too damaged to reattach. Leo gets more than 30 letters from attorneys offering to represent him legally and a lawsuit for $2 million is filed against Eddie shortly after this fact. Eddie contacts his homeowners insurance company, they investigate the claim. They send Eddie something called a reservation of rights letter stating that they are likely not going to pay the claim and are taking steps to rescind the policy from its inception. The insurance company is successful and Eddie eventually files for bankruptcy protection due to a $1.5 million judgment assessed against him. This is Why It Matters When You Get Your Gator! So it truly does matter whether or not you owned the alligator or some other exotic pet before you bought your home insurance policy…Why? With most companies you will find a question on your insurance application on whether or not you are the owner of an exotic pet? This is What Can Happen if You Omit Something on Your Insurance Application. If you answered no when in fact the answer should have been yes even if you didn’t fully understand the question, or you missed it somehow, you have just given your insurance company the legal right to rescind your policy from its inception date! Rescinding your insurance policy means that the insurance company is acting as if your policy was never in force in the first place because you made something called a material misrepresentation on your insurance application. A material misrepresentation simply means you didn’t tell the truth. If a policyholder makes a material misrepresentation on their policy the company is within their legal rights to void your policy from its inception and provide you a refund of all premium dollars. Taking this step means you are completely on the hook for paying all attorney’s fees and judgments completely out of pocket! What if you bought the alligator or exotic pet after you bought your insurance policy? Well the story might turn out differently. As long as there isn’t an exclusion in the liability portion of your insurance policy the company may be legally obligated to defend and pay judgments up to your available policy limit. See how complicated insurance is? Have a question about insurance? We are happy to help! This entry was posted in Louisiana Home Insurance. Bookmark the permalink.